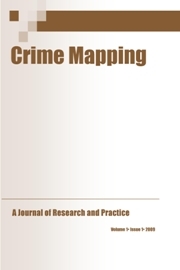 Crime Mapping: A Journal of Research and Practice is a semiannual, international, peer-reviewed journal focusing on the spatial, temporal, and geographical aspects of crime and crime analysis from both a theoretical and an applied perspective. The journal is published twice a year in the Spring and in the Fall. · Research – reports of data from original research or replicate studies carried in new settings or different regions. · Methodology – articles presenting a new or enhanced method, test, procedure or technological approach. · Implementation – descriptions of successful implementation of crime mapping and analysis procedures, reflecting “best practices” in the criminal justice field. · Review - comprehensive, authoritative, summaries of recent insights in specific research and practical areas. The following are guidelines for developing and submitting a manuscript. Manuscripts that do not conform to these guidelines may be returned to the author without review. 1. Manuscripts should be doubled-spaced and 20-30 pages in length, typically between 5,000 and 8,000 words. 2. Manuscripts should include an abstract of 50 to 100 words and a list of four to six key words not already appearing in the title. 3. A title page with the affiliation of the author(s) should be submitted as a separate file – the main manuscript should not include any references to the author(s). 4. Authors should submit manuscripts that are prepared in accordance with the Publication Manual of the American Psychological Association (6th ed.). 5. Tables and Figures should be placed at the end of the manuscript, with notations in the text to indicate placement. 6. In the initial submission, Figures can be embedded as medium to high-resolution graphics within the manuscript. Upon acceptance, all figures must be submitted as separate files as high-resolution images. The images should be saved in TIFF (300ppi) or EPS (800ppi) format. Both the on-line version of the journal and the in-print version are published in full color. 7. Upon acceptance authors will be asked to provide a brief biographical paragraph describing each author’s affiliation, current research interests, and recent publications. 8. Manuscripts should be submitted electronically as an email attachment to t.hart@griffith.edu.au. Submissions should include appropriate contact information. Note: Authors bear full responsibility for the accuracy of references, quotations, tables, and figures. It is the author’s responsibility to secure such permission, and a copy of the publisher’s written permission must be provided to the journal editors immediately upon acceptance of the manuscript for publication. Upon acceptance of the article, authors are expected to complete the copyright agreement form and mail it to the editor.